Joy Creek Photo Archive (c) all rights reserved We have grown Rosa 'Munchen' for about 15 years in our rose-Hydrangea border. It is has proven to be both a strong grower and disease free. 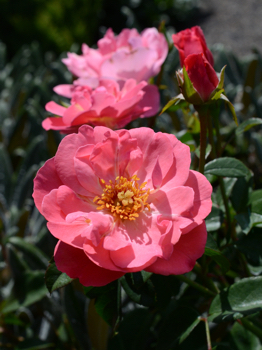 Once it starts blooming in mid-June it is continuously in flower with clusters of 2.5-inch coral pink flowers. The fragrance is light but spicy sweet and as with most roses the fragrance is more noticeable in the fall as the temperatures cool down. I have found that Rosa `Munchen' needs very little tending or pruning to be happy. For me it is always a joy to see Munchen still well in flower right up to our first heavy frost. If after reading this description you think I like the plant a lot, you are correct. Continuous from June to Frost 3.5 ft. x 4 ft.